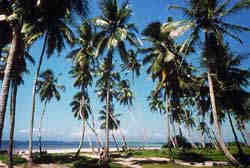 Located at the Indian Ocean is considered to be one of the most beautiful regions on our planet. Wild animals and a fantastic nature with plants of all kinds, can be found in Kenyas very famous nature Parks. Combined with the georgous white Beaches and a colourfull mixture of landscapes and different cultures, it is a truly uniqe Paradise on Earth. Plus a perfect climate, with temperatures even in "Winter" dropping not below 22° Celsius, making Kenya an ideal Vacation or retirement destination. There is entertainment like Discos, for the youngsters, as well as beautifull quiet beaches where you can relax. And especialy older people, which may have trouble with their"Bones" will find what wonders the sun and the seawater will do for them! Vegetation: from Desert to Rainforest. Industry: Farming, Trading, Tourism, Oil etc. 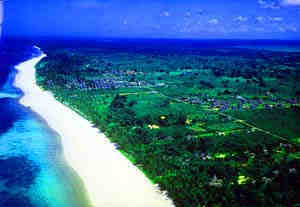 Diani Beach, is located at Kenyas Southcoast. 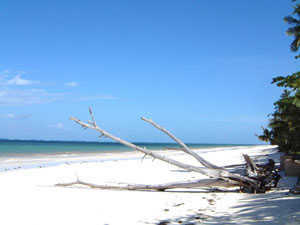 Perfect white and natural beaches, is what Diani Beach is famous for. A nice variety of Shopping Centers, and Stores of all kind, will satisfy your shopping needs. There are Restaurants, Bars, Diving Scools etc.to entertain you, and to make your Kenya stay very pleasant. From Diani Beach it is only 40 Minutes to the International Airport, which is offering daily connections to Europe. Doctors and a Hospital with European standards are of course also within quick reach. Earthquake or Hurrikanes, as you might know it from other exotic destinations, are unknown in Kenya ! The time difference to Europe is in summer only one, and in winter 2 hrs. Kenya is located on the equator on the continent's east coast. The country is well known for its scenic beauty and varied wildlife. Although only about 20 percent of the land is suitable for cultivation, the majority of Kenyans are farmers who produce crops mainly for their own needs. Coffee and tea, grown for export on large plantations and on small farms, together with tourism are Kenya's most important sources of foreign exchange--money used to buy foreign goods. Kenya has two wet seasons and two dry seasons. The rainy seasons extend from March to May and from November to January. The amount of rainfall is greatest in the highlands of Kenya, which are located in the west. The lowland deserts of the north receive the least amount of rain. Occasionally the rains fail or are below normal for consecutive seasons, leading to drought. Because of the uneven distribution of rainfall and the variation in land elevation, ecological conditions differ throughout the country. However, three main geographic zones have been determined to exist: the highlands, the semiarid lowlands, and the deserts. A fourth, called the coastal zone, occupies a narrow strip along the Indian Ocean. In the western part of Kenya the land rises to more than 5,000 feet (1,500 meters) above sea level. These highlands, which represent less than 25 percent of Kenya's land area, are divided by the Great Rift Valley. In the eastern part of this region, Kenya reaches its highest point at the peak of Mount Kenya, 17,058 feet (5,199 meters) high. The highlands are the only part of the country where rainfall is sufficient--over 50 inches (1,270 millimeters) a year--and reliable enough to support farming. Because most Kenyans depend on agriculture for a living, it is in these highlands that the majority of the population lives. Most of the forest that once covered the land has been cleared for crop production. Some of Kenya's forest does remain, and national parks have been created by the government to protect the local vegetation and the wildlife. The semiarid lowlands. Much of Kenya is semiarid, receiving between 15 and 30 inches (380 and 760 millimeters) of rainfall a year. This amount of rainfall is insufficient for production of crops, so cultivation is limited to the borders of rivers and swamps where irrigation is possible. In the past there was little farming in the lowlands, and most of the inhabitants were nomadic or seminomadic herders. The number of lowland farmers has increased, however, as people have moved from the overcrowded highlands in search of land. The main economic activities are livestock raising by Kenyans and wildlife viewing by foreign tourists. Both the wildlife and the livestock are able to graze on the vegetation that grows under the dry conditions. Trees, such as the acacia, are scattered throughout the bushy grasslands. The herders, such as the Masai (Maasai), raise cattle, goats, and sheep and move them seasonally from place to place to give them access to water and pasture. The wildlife includes large numbers of gazelles, zebras, and wildebeests, and predators such as the lion and cheetah are also prevalent. Also common are the predatory leopard and wild dog and other grazing animals such as the antelope, elephant, buffalo, and rhinoceros. National parks have been created where these animals and others are found in large numbers. Unfortunately, water is scarce, and there is increasing competition for it among the animals. The deserts of Kenya are not so extensive as other deserts in Africa. They are located in the north of the country. The vegetation is sparse, consisting of hardy grasses and occasional bushes. Desert peoples are few, but the area includes some nomadic people, such as the Somali and the Gabbra, who raise herds of camels and goats. On the edge of the desert region is Lake Rudolf (Turkana), which stretches down from the border with Ethiopia. It is the site of a small fishing industry. Archaeologists working on the shores of the lake have found evidence of some of the Earth's earliest people, dating the ancestors of man back some 4 to 5 million years. Stretching along the shores of the Indian Ocean is a narrow strip of land 10 to 15 miles (16 to 24 kilometers) wide that separates the dry interior from the sea. It is an area with relatively heavy rainfall, 40 inches (1,000 millimeters) a year, and is an important crop-producing area. Cash crops such as coconuts and cashews are produced. For centuries the coast has been important in trade across the Indian Ocean, and ancient ports, such as Lamu, remain as evidence of the early coastal trade cities. Today, Mombasa is the largest coastal city and Kenya's largest and busiest port. It has modern facilities, an oil refinery, and a variety of light industries. The port also serves the landlocked countries of Uganda, Rwanda, and Burundi. The long and beautiful white coral sand beaches are the basis of Kenya's coastal tourist industry. Hotels serve tourists along the entire length of the coast. Kenya has more than 100 different ethnic groups. This poses a potential problem of communication. Swahili and English have been selected as national languages and most people speak at least one of these as well as their own local language. The people are also divided among many religious groups. African traditional religions are widespread as is Christianity, which was spread by missionary groups in the 19th and early 20th centuries. Islam is particularly well established along the coast; the Kenyans of Asian origin are predominantly Hindus. Kenya's artistic heritage is represented by a variety of crafts. Among them are matweaving on the coast, wood carving by the Kamba people, and beadwork jewelry made by groups such as the Masai and the Samburu. Among the nation's 28 million people, the most populous groups are the Kikuyu, the Luhya, the Luo, and the Kamba. There are just over one million herders such as the Masai and the Somali living in the semiarid and desert areas. An increasing number of people live in the capital city of Nairobi and in other large cities. In the early 1990s it was estimated that Kenya's population was increasing at the rate of 3.6 percent a year. This growth rate, one of the world's highest, greatly increases the people's demand for land, housing, food, jobs, education, medical care, and other services.These conditions place a severe strain on the economy of Kenya, a country whose resources are extremely limited. One reason that Kenya has remained heavily dependent on agriculture is its lack of fuel resources, such as petroleum. Totally reliant on foreign countries for oil, Kenya's manufacturing industries have developed slowly. Some energy is forthcoming from hydroelectric projects, but it is inadequate, and additional electric power must be imported from neighboring countries. To remedy this situation, especially in light of oil-price increases, the government has accelerated development of alternative sources of energy. Kenya now produces power from geothermal (natural heat from the Earth's interior) sources, and plans are to increase the number of geothermal units. The sugar industry, which can produce alcohol for fuel, is another developing source. The Kenyan economy receives minimal support from such other resource areas as mining, forestry, and fisheries. The most rapidly growing population group in Kenya is the farmers. In many areas, however, there is insufficient land available, and some farms have been subdivided into several units. These are often unable to produce sufficient crops to meet the needs of the families tending them. Increasing numbers of people are migrating to areas where more land is available. Most of the areas where people can find land are on the dry edges of the highlands. In these areas soils may be less fertile and the rainfall less certain, making farming risky. The vast majority of Kenya's farmers own only about seven acres (three hectares) of land. On these small farms most of what they produce is to meet their family's needs. Some crops are grown for sale to raise money to buy consumer items. Typically a farmer grows several different crops together in the same field: a grain such as corn; a legume such as beans; and perhaps a few trees producing coffee, bananas, or mangoes. This allows the family to harvest a variety of foods for a balanced diet. In order to increase production, the government sponsors agricultural experiments and encourages farmers to try different production methods. Some farmers also keep a few animals such as cattle and goats, and many raise poultry. Tea and coffee, raised for cash and export, are two of Kenya's major sources of income. The herders raise such animals as cattle, camels, sheep, and goats. These produce milk and meat for the family and some to be sold for cash. Herding families use the cash to buy grains to supplement the meat and milk in their diet. As the human population grows so have the number of animals, and there is concern that they may be overgrazing the land. In many parts of the country the government is promoting better use and management of the grazing land. The other major earner of foreign exchange, the tourist industry, does not bring income to as many people as coffee or tea sales. Tourist facilities are concentrated in Nairobi, along the coast, and in the national parks. The industry is largely owned by foreign companies, however, and relatively few Kenyans benefit from it. Tourists visit Kenya for a number of reasons. Its beaches are beautiful and uncrowded, and hotels are of high quality and serve good food. Kenya has one of the world's largest wildlife populations, and a wide variety of animals can be seen in national parks. There, excellent hotels with special viewing facilities have been built for tourists. The parks protect the wildlife, but some species, such as the rhinoceros and elephant, are still hunted by poachers for their horns and tusks. Nairobi also attracts tourists, and it has become a site for international conferences. The cities of Kenya have been growing partly because of emigration from the countryside. Most salaried jobs in the cities are in the government bureaucracy, in industry, and in occupations such as sales and domestic services. Kenya's industries include food processing, brewing, clothing and textiles, transport equipment, and refined petroleum and petrochemicals. The majority of companies are located in or near Nairobi, but the government is encouraging new firms to locate in other towns so that more of the country can benefit from industry. Nairobi, the capital city of Kenya, is located on the railway line at the junction between the lowlands and the highlands. More than 60 percent of Kenya's salaried workers live in the city, which dominates the nation's economy. It is an important commercial center and many foreign firms base their east African operations there. Most government employees also work in Nairobi. The Kenyan economy is supported by one of the best transportation systems in Africa. The railway links the main towns and paved roads reach all but the most inaccessible towns. The main roads to Tanzania and Uganda are paved and the one to Ethiopia is almost completely paved. Nairobi's modernized airport is one of Africa's busiest. Flights connect the city to other African cities, and to Europe, the United States, and Asia. Education has been strongly supported by the government and nearly all children go to primary school, which is free. The adult literacy rate increased from 20 percent in 1960 to 69 percent in 1990. After primary school the educational system becomes highly competitive and few of those who go on to secondary school gain admittance to the University of Nairobi or any of the country's smaller colleges.